If something is wrong with your plant, it could be a pest, a disease or something environmental. I sometimes get asked by Schnarr’s customers to help diagnose plant problems in the store so that they can select the right product to treat it. I can often be helpful, especially if the customer has time to allow me to look things up using my favorite online resources. There are way too many possibilities for any human being to remember them all! It’s extra helpful if the customer brings in a sample of the pest or affected plant part. If you want to do a little research before shopping for products, here is my procedure. 1. First I go to images.google.com and do a descriptive search to see if any pictures come up that look like my problem. The more you can identify the flora and fauna in your garden the more precise your initial searches will be. I’ve gotten a lot of joy during my whole life from the hobby of nature study and although I still have massive amounts to learn, being able to identify some common plants and animals in the area makes it easier to get started. There are ways to identify plants and invertebrates that involve knowing the scientific terms for body parts or plant parts, but if you don’t want to get that detailed just describe what the specimen looks like and see what the image search reveals. Once when trying to identify a bug to find out whether it was beneficial or a pest, I did a search on the phrase “true bug wide lower legs” and I was presented with pictures of Leaf Footed bugs. That was my bug all right, and a pest. I learned what a Prometheus Moth that I saw on my deck was by searching for “huge brown moth Missouri” and comparing the pictures. Sometimes you have to add more detail. My first encounter with a Catalpa Worm in a state park was memorable because they are huge and beautiful. A search for “huge larva black and yellow Missouri” was too vague for a quick ID but a search for “huge larva black and yellow Missouri Catalpa” gives instantly good results. It helped that the Catalpa is a distinctive looking tree and I remembered what the larva was feeding on. The cultivar of the plant is very helpful to know, if applicable. Some cultivars are either more resistant or more susceptible to certain plant maladies. If you can identify the plant but not the pest or disease, try a search for “——- pest on Name of Plant” or “——- blight on Name of Plant” or “Symptom on Name of Plant.” For example recently I looked up “webs on burning bush” for a customer and narrowed it down to two possibilities. I found one product in the store that would treat both. Depending on the symptoms other common search terms you might try are things like “fungus”, “mildew” “rot”, “rust”, “disease” or “wilt”. If you don’t know the plant name, describing the plant might help, for example “chew holes in vine” or “yellow spots on leaves small tree”. With a name of a plant or pest or disease in hand, I start to go to my favorite online horticultural resources to refine the identification as much as possible and look for causes and treatments. If I’m at home, my library of gardening books is helpful. Missouri Botanical Garden has a nice library that you can consult in the Kemper Center, along with computers for guest use. This reference area is quiet with soothing fountain sounds in the background and I like to sit there with my laptop and write sometimes. 3. Use as many relevant factors as you can to narrow down a diagnosis. For example, in the “webs on burning bush” search results, there were initially more than two possibilities, but two of the possibilities were listed as being common in hot dry weather. Since that happened to be our conditions at the time I went with those two possibilities over the others. 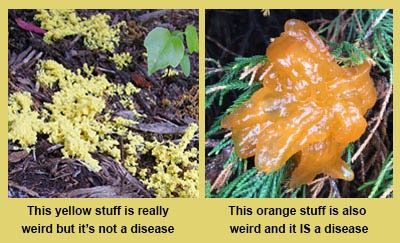 In other words, different growing conditions, seasons or other factors may make one disease or another more likely. 4. Put a piece of white paper underneath the affected area and shake the plant. The white paper makes tiny pests or debris easier to see. If you are looking at turf, is the damage regular or irregular in appearance? Rigidly regular marks may indicate damage of human origin. 6. Sometimes you need to consult a specialist. The identification of “shield bug dung beetle gold and brown spots Ozarks Missouri feeds on dung” still eludes me. I should have taken a photo, then I could send it to the What’s That Bug web site or show a ranger the next time I go to a state park. If you can, take a photo or bring in a specimen to the expert you are consulting. Here is a link to the Missouri Botanical Garden Gardening Help options. When you consult professionals for help, you may get recommendations for products that are not marketed to the home gardener. If you don’t see what you are looking for in our store, please ask us for help because there are many things we can order from the warehouse in addition to what is on the store shelves every day. My design for in-store signage for use on an endcap at Schnarr’s Hardware store in Webster Groves, MO was influenced greatly by my love of stencils. I had recently used stencils to make signs for another store. I was happy with the results and eager to try similar lettering techniques with a different look. 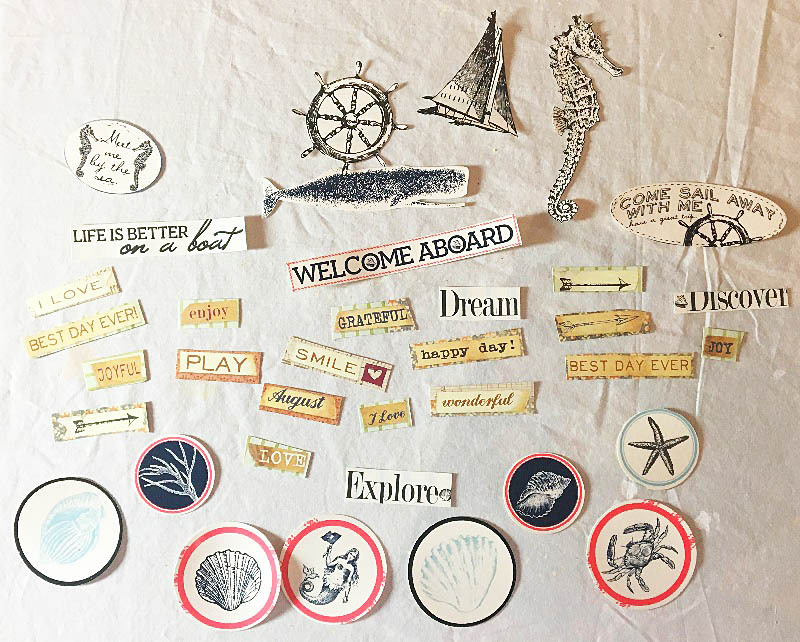 I took a set of chipboard reusable letter stencils that I got from Schnarr’s and used them to trace letters for the words “DIY Classes” on pieces of scrap cardstock and thin chipboard. I cut out each letter by hand using an X-acto knife, metal ruler and self-healing cutting mat. My next step was to give each letter piece a wash of white paint mixed with matte medium and water. After the paint was dry I used some rub-ons burnished with a bone folder to add hardware and building imagery over the white paint wash around the cutout letters. Then with a small brush I outlined the letters and edges with a painted-on line of non-watered down white paint. 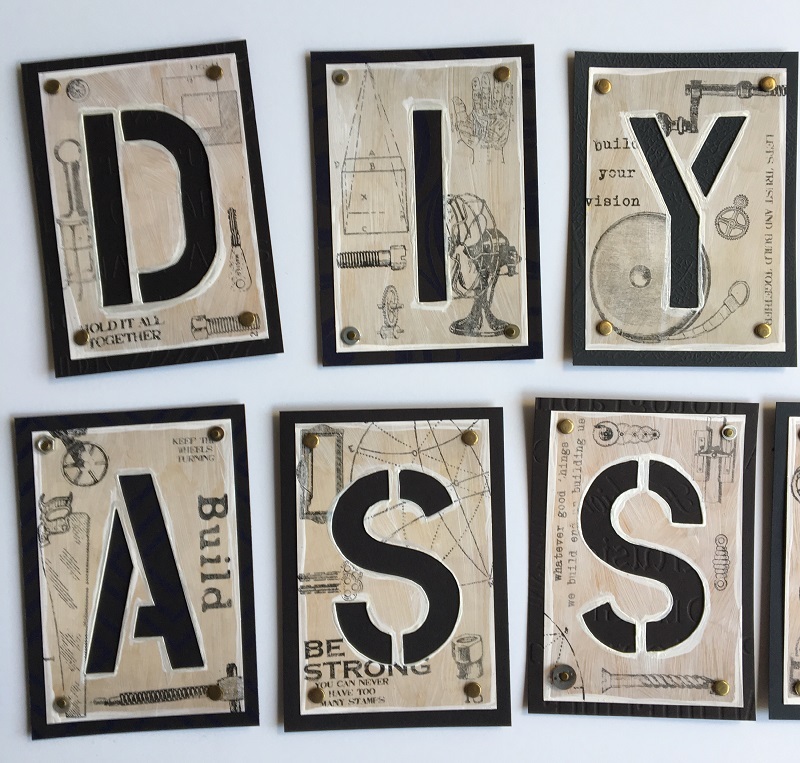 I cut out pieces of black cardstock slightly larger than my letter pieces and placed one behind each to add a frame and make the letters stand out. With an awl I poked holes in the four corners of each letter piece and fastened the layers of paper together with brads, using a variety of washers from my stash here and there with some the brads for extra variety and interest. After making my letters, I measured the space available for my sign and took stock of what materials I had on hand. 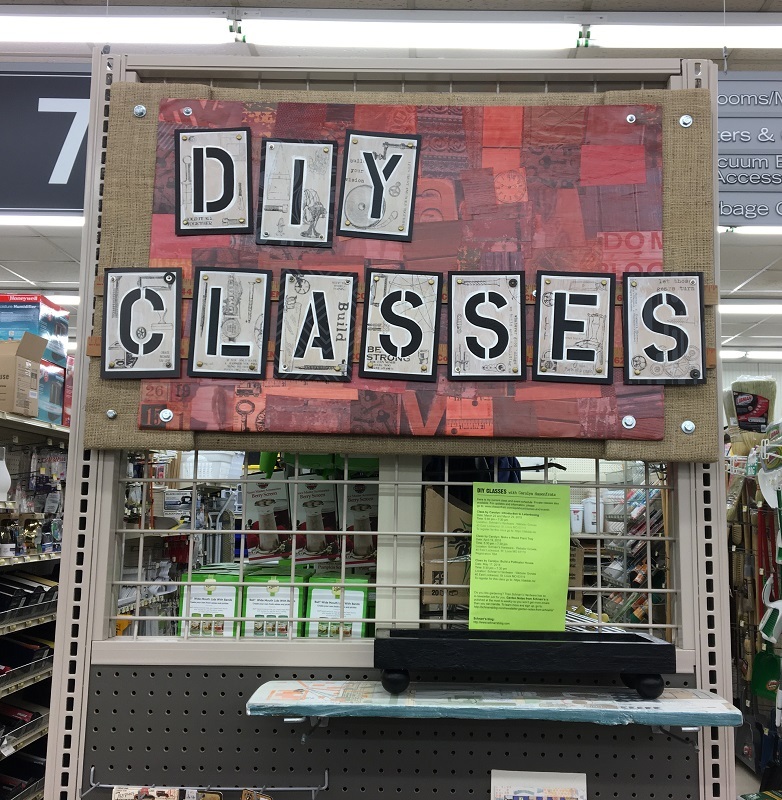 I knew I wanted a lightweight sign that would harmonize with the vintage imagery in the rub-ons, look good with the store’s color scheme and suggest the types of mixed media techniques I teach in the DIY Classes I’m promoting. 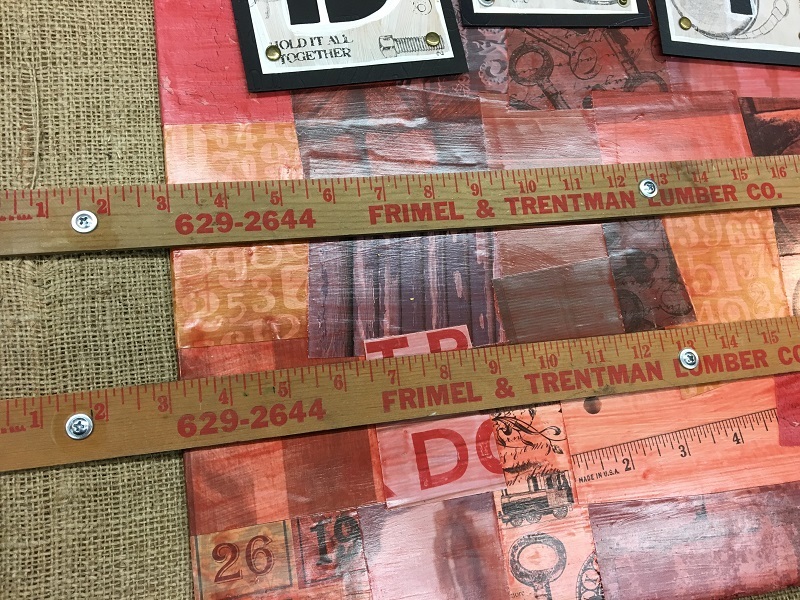 I decided to decoupage paper imagery all over a piece of foamcore and paint over the paper pieces with a wash of red-brown paint so that the designs on the papers would show through and not be too dominant. Most of the paper I chose was by the company DCWV. I looked for paper designs with things on them like vintage letters and numbers, rulers, keys, hardware, aged wood and brick, clock faces, vintage machinery and the like. I used Modge Podge to glue the papers over the foamcore and I mixed matte medium with the paint to make a translucent wash. The finished foamcore panel was a bit smaller than the space I needed to cover so I made a frame out of cardboard covered with burlap to mount it on. First I cut out 8 pieces of corrugated cardboard, 2 for each side of the frame for extra strength. I bound the pieces of cardboard together with masking tape then I covered the cardboard frame sides with burlap, securing the burlap with tape on the back side. 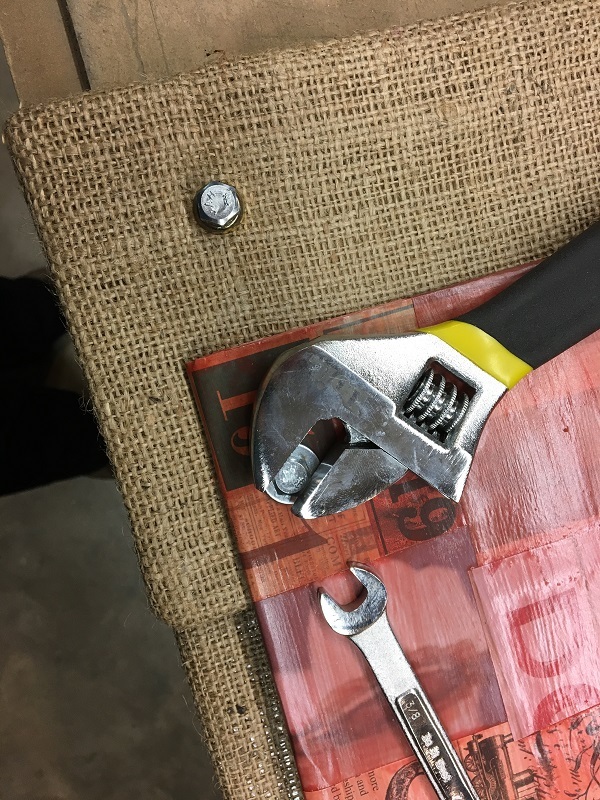 I poked holes in the burlap covered pieces and in the front foamcore piece with an awl and I used nuts and bolts with washers to attach the layers together. I laid out my letters on top of the cardboard/burlap/foamcore assembly and saw that the second line, “Classes” was a bit too wide to fit onto the foamcore and was going to have to overlap the burlap edges to fit. I decided to bolt on a couple of old yardsticks to provide a surface for attaching the second row of letters. This emergency adaptation turned out to be a happy accident because in my opinion the rulers added great interest to the design and looked terrific with the images and colors I was using. My last step was to attach the letters to the sign with mounting tape. I love this stuff! Stop by Schnarr’s Webster to see the finished sign. On the endcap below it you’ll find samples of projects for future classes I’ll be teaching along with assorted art and craft supplies, some offered at clearance prices! 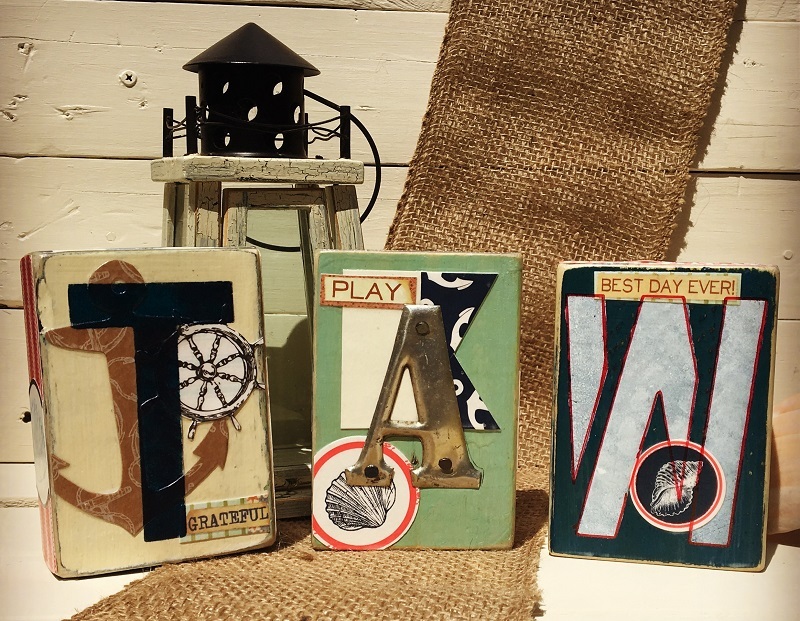 Cut blocks of wood into 5″ x 3.5″ x 1.5″ pieces (two-by-fours cut into 5″ lengths). Make as many pieces as you want letters. 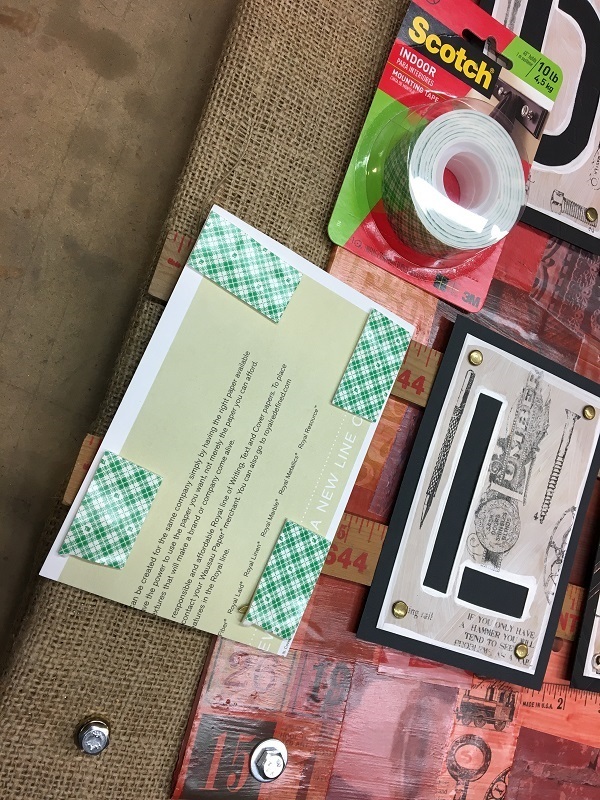 For example, if you want to display someone’s initials, cut two or three blocks. To spell out the word “holiday” cut 7 blocks. 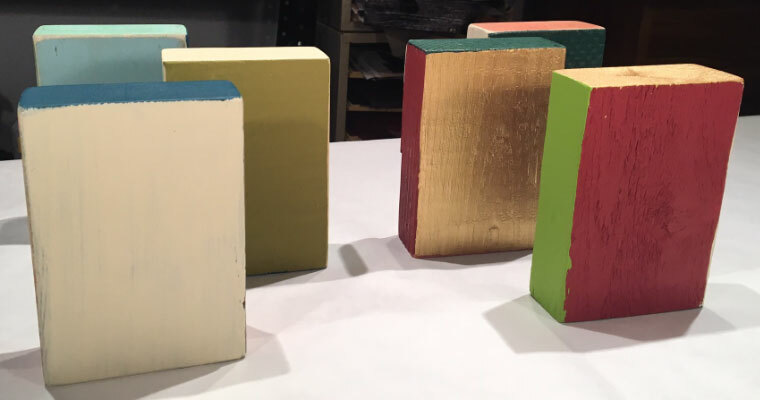 Paint all sides of the wood blocks with holiday colors, beachy colors, or any color scheme of your choice. Let dry. Sand the blocks to bare the corners and get rid of any painting mistakes. I’m fond of the distressed look so I don’t mind the sanded spots giving an aged and worn appearance to the wood. The distressed look is even better if your wood pieces have bumps, knots or other flaws in them. I worked on several blocks at a time so I wanted to experiment with different layering effects. One some of the darker colored sides, I stenciled a letter with white paint. 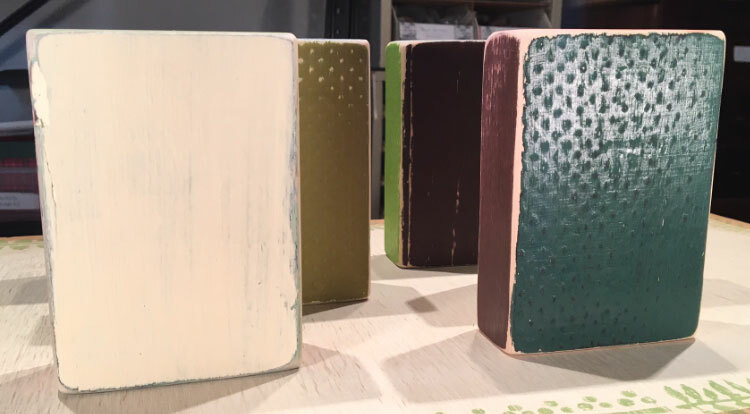 Cut some shapes out of decorative papers and use Modge Podge to adhere them to some of the painted wood surfaces. You might want to use shapes that are related to the theme of your project, such as ornament shapes or trees for Christmas, fish for beachy, trees or deer for woodsy, etc. Possible sources of shapes to trace are stencils or cookie cutters. Let dry. You can also cover an entire side of the block with paper if you want. 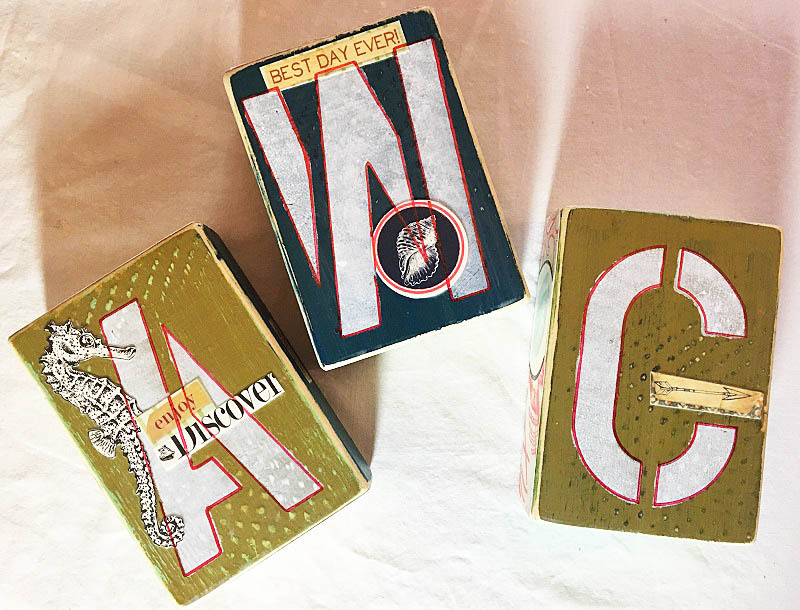 Since I was working on several blocks at a time, I labeled the backs of my paper pieces and the spots where I wanted to put them with corresponding letters so I could match them up later. 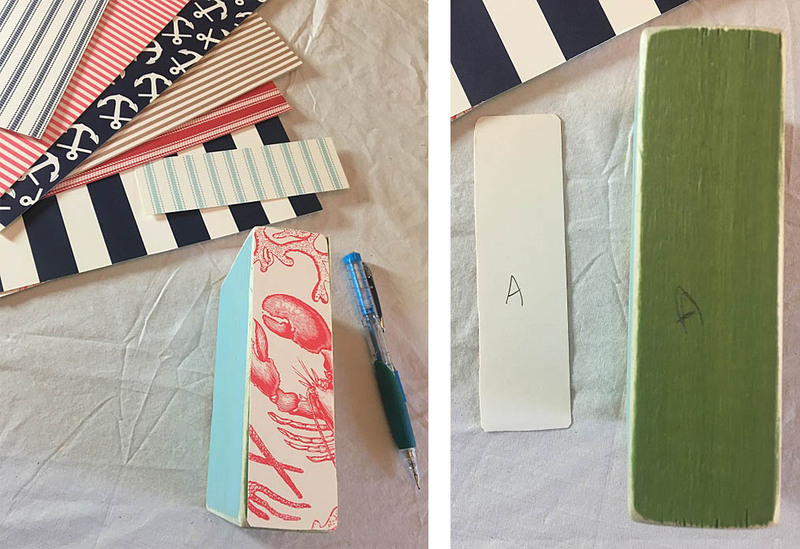 Here is the method I use to apply paper with Modge Podge or other glue without the paper wrinkling. Paint one side of the paper pieces you want to glue with Modge Podge and let dry. Paint the other side and let dry. 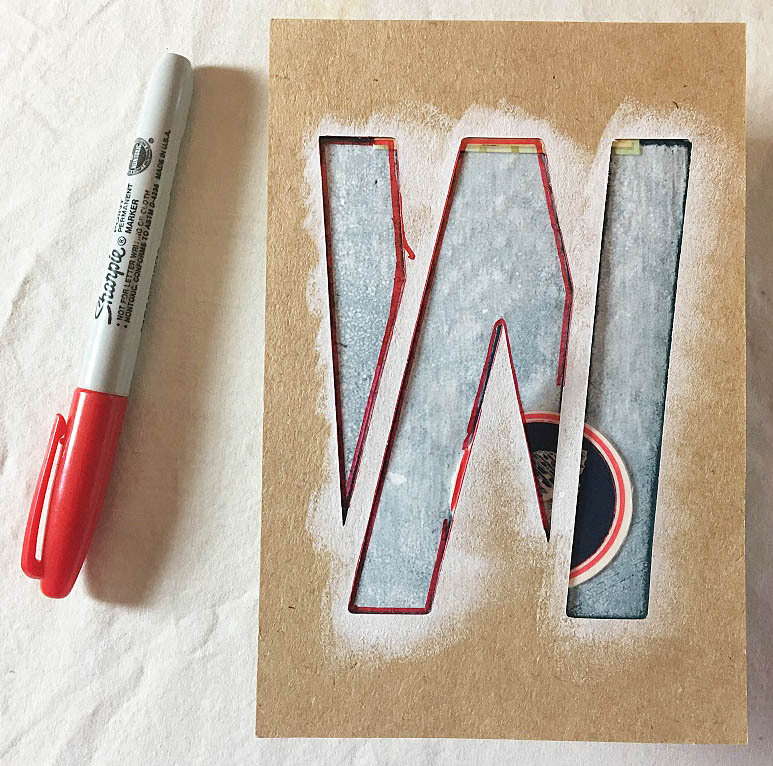 When ready to apply, paint a thin (but not watered down) layer of Modge Podge on the back of the paper and on the surface you’re gluing it to. Press paper in place and burnish with the squeegee tool to get a flat seal and push out excess glue. Wipe glue away. To help me decide where to place paper pieces, I outlined in pencil where my stenciled on and metal letters would go. Here are the fronts and backs of my blocks with the paper pieces glued on. Mix up some white or off-white paint with water to make a light wash. 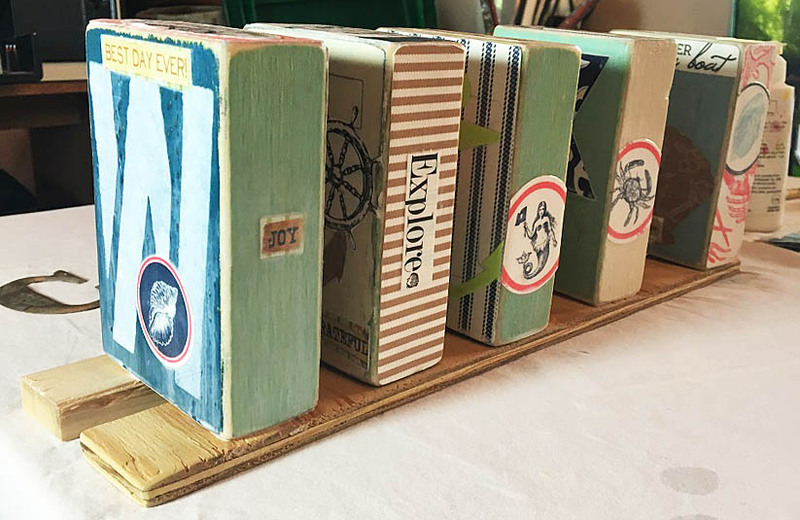 Paint your wood blocks with the wash and let dry. 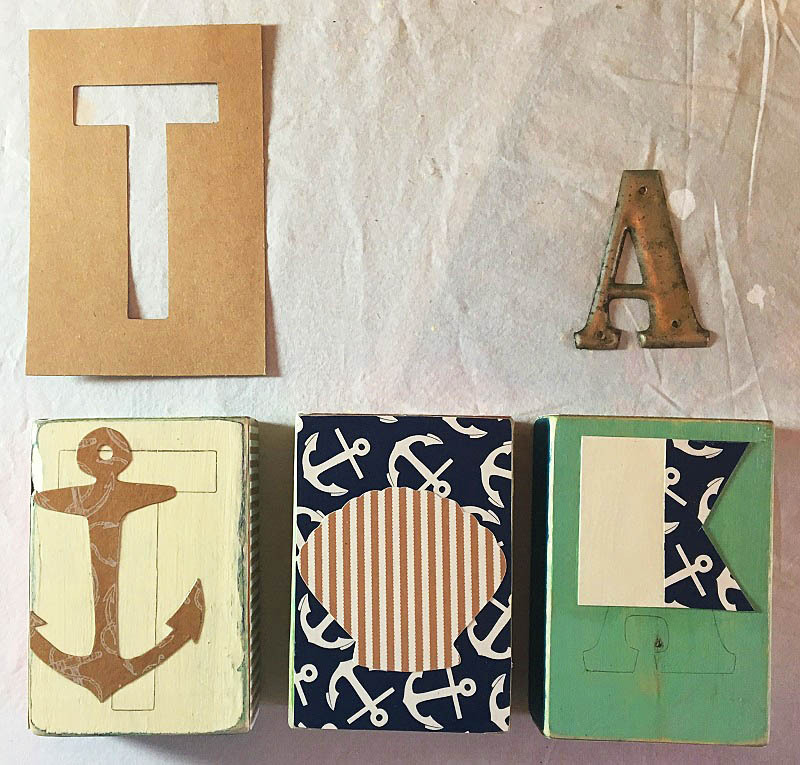 Use painter’s tape or masking tape to hold a letter stencil where you want it on a wood block. Sponge paint through the stencil. Remove stencil and let block dry. Repeat for each block until all your letters are done. 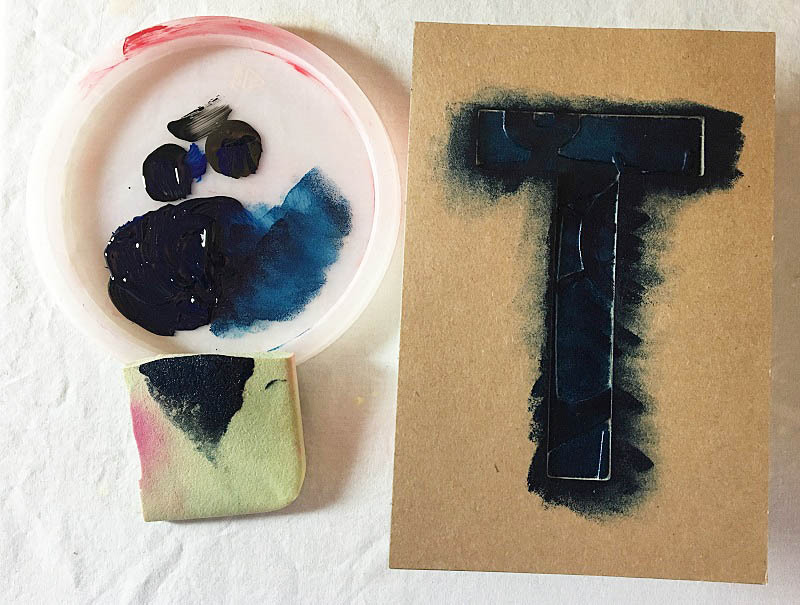 If you think your letters need a little more emphasis, you can place your stencil over the letter again and use it as a guide to draw an outline with a Sharpie Marker. You’re done! How Much is a Tree Worth? On a hot afternoon at our Ladue store a couple of weeks ago, we had a power outage that affected our store and a lot of the surrounding neighborhoods. The next afternoon at my condo my neighborhood had the first power outage I’ve experienced in my 14 years living there. According to updates from an Alderman in my city who was in contact with Ameren Missouri, there was extra load on some stations due to storm damage from a couple of days earlier. The combination of the extra demand with the heat was too much for some of the stations to handle. Someone more technical than me can probably explain it better or understand it better, but what I get from this is that hot temperatures can stress an already stressed system to the point of failure. This is a good time to reflect on a group of living things that often seem so permanent and indestructible that we sometimes don’t give them the respect and care that they deserve – trees! When we are managing our landscapes or contracting for services, we have to make decisions about how much money to invest in trees. How much do we want to spend to buy the specimens? How much effort do we want to put in selecting, planting, establishing and maintaining the tree? Should we spend the money to get it pruned correctly by an expert or to treat a disease or pest? If we decide we don’t want it, how much will it cost to remove? Those decisions will become easier to make if you know the actual economic benefit of your tree. According the Treekeepers Comprehensive Introductory Course handbook, “planted in the proper location, trees can reduce energy demand by as much as 50%”. The recent power outages I experienced occurred at approximately 3:15 pm and 5:30 pm respectively. Those are often very hot times of the day so it seems likely that air conditioning was one of the factors contributing to the high demand. You will notice that the air is noticeably cooler in the vicinity of trees – that is because water evaporates from the leaves of trees and the change from water to water vapor uses up heat energy from the air. Just for fun, I ran a test on an oak tree that is at the corner of my condo to see what the value of it is in hard cash terms. I used a really useful tool called i-Tree Design. Here is a screenshot showing some of the benefits of this tree over a 10 year period. You can run tests using your own property as an example with different sizes and species of trees. The tool will even show you spots on your property where trees will have the most and least benefit. It’s lots of fun and very enlightening! Out of curiosity I ran a calculation on the Rose of Sharon tree I planted near my deck. 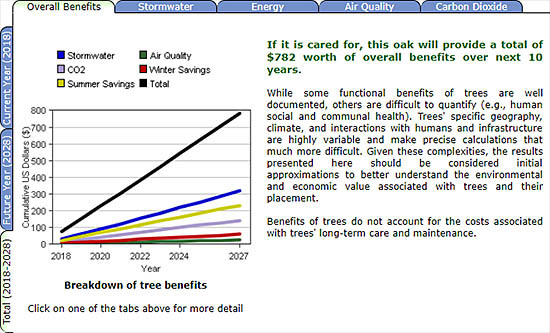 According to the i-Tree Design tool, the economic value of that tree is $174 over 10 years. Maybe that doesn’t sound impressive at first, but consider that the tree itself was free – it came from a seedling that I transplanted from my parents’ yard. I spent about five minutes planting it and when it was tiny I probably watered it a few extra times during the first couple of weeks. It has required little care since then – the only thing I remember doing with it is mulching it and weeding out it’s extra seedlings that I didn’t want. The tree is small enough that I could remove it myself for no cost if it came to that. Economic benefits are not even the reason I planted the tree in the first place – I wanted to look at the beautiful flowers and enjoy watching the wildlife that I knew would come to feed on the flowers and seeds. It attracts a steady parade of butterflies, hummingbirds, finches, other birds and various bee species for months on end. If I had PAID $174 for the tree I probably would consider it money well spent. If you plant the right tree in the right place and care for it correctly, you will cut down your energy usage. You also may help reduce the demand on electrical equipment in your neighborhood and prevent power outages. A power outage is often just a minor inconvenience, but under certain circumstances and to vulnerable people an outage can be costly and dangerous. If you plant trees and invest in their establishment and care, it is possible for your tree investment to pay for itself and make life better for your community at the same time. All you need is the right information – I hope the resources I’m sharing will help you to get it.